To mark the end of a very hectic week for me, I am going to post a dessert recipe today. Although Friday seems to have come so quickly this week, every day has been super busy. I am yet to read the other recipes from my favorite blogs. 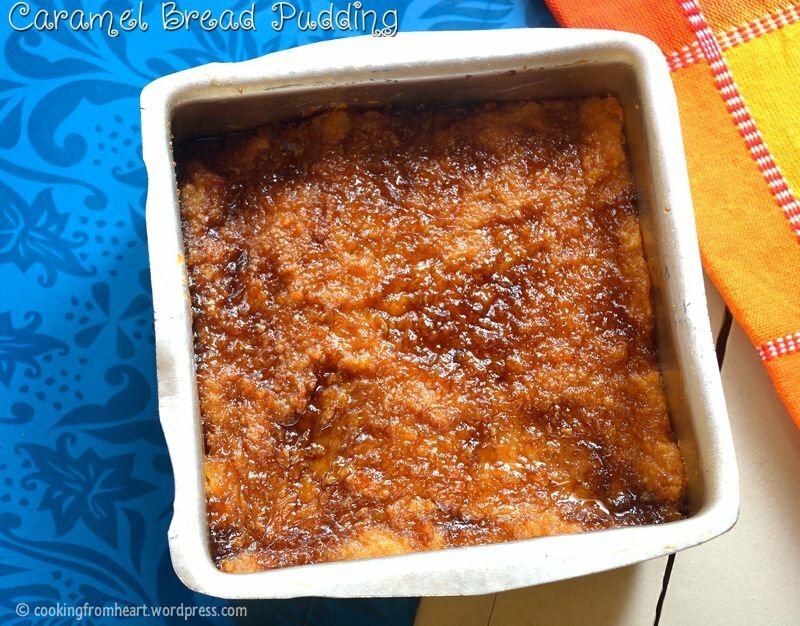 I cant wait for the weekend now 🙂 Moving onto this recipe, it’s a very simple bread pudding. 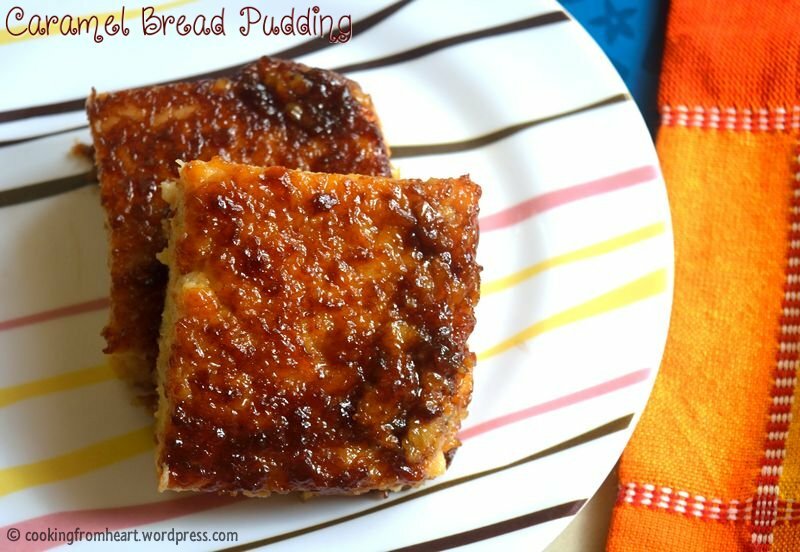 When I had some extra slices of bread, I was looking for ways to utilize them and that’s when I got the idea of making a bread pudding. 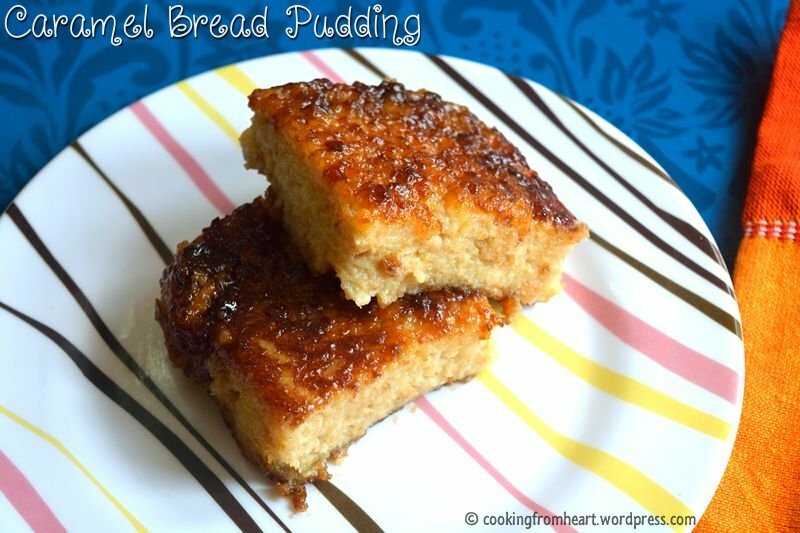 From what started as an idea of Bread Halwa, it turned into Caramel Bread Pudding. This is one of the simple desserts that can be made very quickly with a very few ingredients. In a thick bottomed vessel, bring milk to a boil. Reserve a few tbsp of milk. Roughly tear the bread slices (I kept the edges on), put them in the boiled milk. Mix well. The bread slices will absorb the milk and dissolve soon. Add 4tbsp of sugar and mix well. Keep the flame on low. If the bread mixture is sticking to the bottom of the pan, ½ tsp of butter can be added. Add vanilla essence to the cooking bread-milk mixture. Mix well. Meanwhile, add the reserved milk with 1 tbsp of custard powder and mix well. Pour the custard mix to the bread mixture. Cook for 4-5mins until the raw smell of the custard is gone. Switch off the flame. Let the bread mix cool down. Meanwhile, pre-heat the oven at 180 deg C. Coat the baking dish with butter and sprinkle half of the brown sugar at the bottom of the pan, evenly. Set the cooked bread-milk mixture in the baking pan. Sprinkle the rest of the brown sugar all over the top. 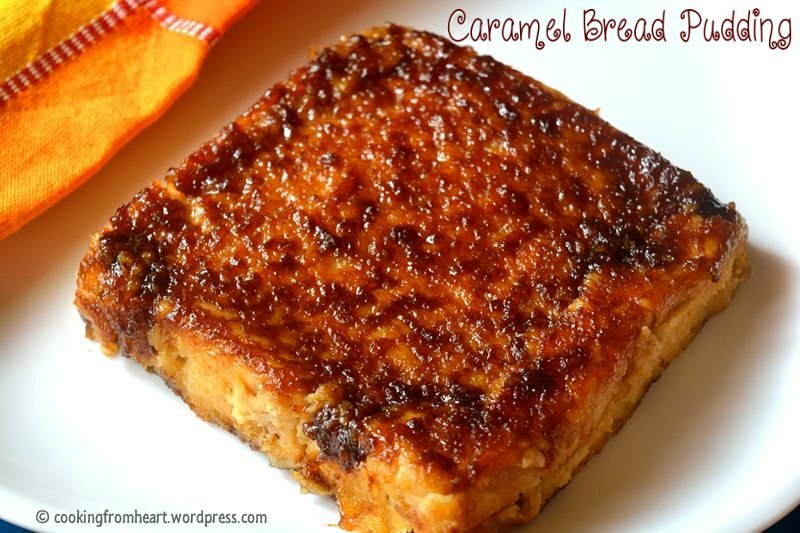 Bake the bread pudding for 10 mins at 180 deg C and for 5 mins on the grill mode so that the top is nicely caramelized. Remove it from oven and let it rest for 10mins before turning it over. Serve either warm or chilled, as it is. The bread should completely dissolve in milk and should become a smooth paste. On adding the sugar, it turns a bit runny. Keep cooking until the mixture comes together. Adjust the quantity of sugar as per personal preference. Instead of vanilla essence, green cardamom powder can be added as well. Instead of Vanilla Custard Powder, corn flour can be substituted. Adding the butter while cooking the mixture will ensure that the mixture is not too sticky. The time to bake the pudding varies from oven to oven. Keep checking the pudding and as the sides turn golden brown or the top turns golden brown, remove it. I am sure condensed milk would make this pudding awesome 🙂 especially would be a win with children 🙂 I was a little hesitant to use it keeping calories in mind. sigh! 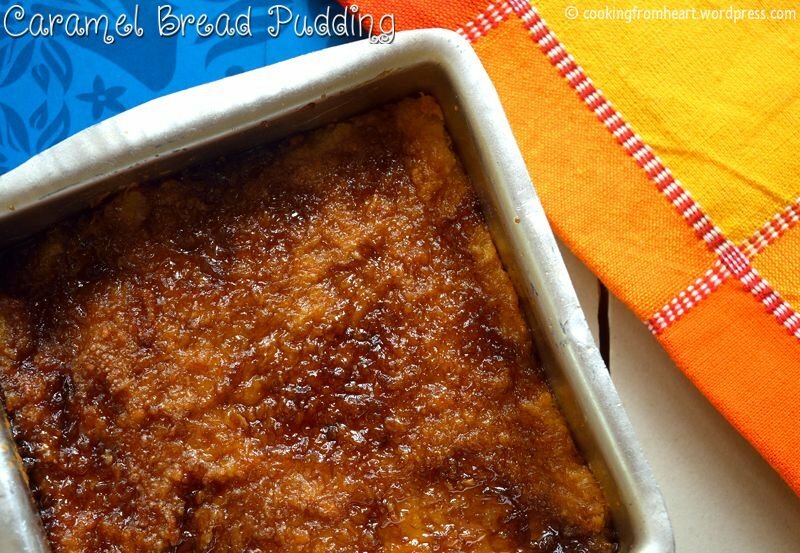 This sounds different than other bread puddings i have tried! Looks good! Thanks! Yes I missed about 20 comments all in spam! yes it is!! This nice friend told me they didn’t hear from me back so they looked into it and when I looked about 20 messages from her! !